Quad Steer Tugger Trailers (TT-QS) provide safe and efficient material handling alone or in logistics trains. They can be pulled by virtually any tugger, including automated guided vehicles (AGV.) Operators can pull high-capacity pick trains comprised of multiple TT-QS units, which secure to one another with universal tow bars and hitches. The quad-steer mechanism creates clean, reliable tracking, improving safety for tugger operators. These trailers create a predictable follow pattern behind tuggers, which frees operators to keep their attention on the path ahead. Quad-steer models can navigate tight corners and even U-turns easily. 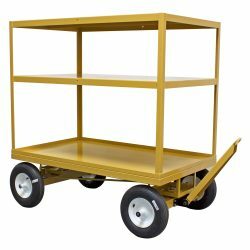 Heavy-duty steel construction gives these units high load capacities, while a damage-resistant powder coating ensures long, dependable service life. To learn more about Quad Steer Tugger Trailers, or to find a dealer near you, call BHS at +1 314 423 2075 . Replace 6” x 2” casters with 8” x 2” polyurethane-on-steel casters.